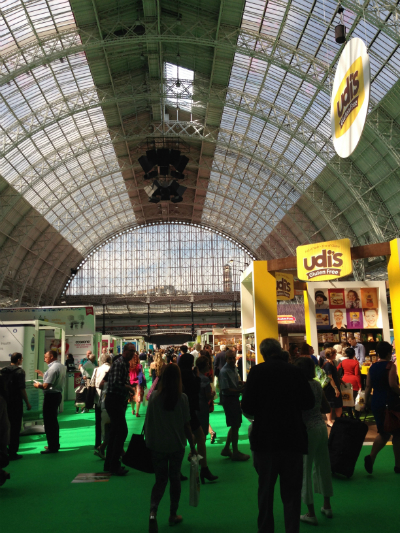 Today was the first day of the Free From fair at the grand hall Olympia. I took the train from Surrey and arrived not long after the show opened. The venue this year is lighter and much bigger than last year, making it a much nicer experience. 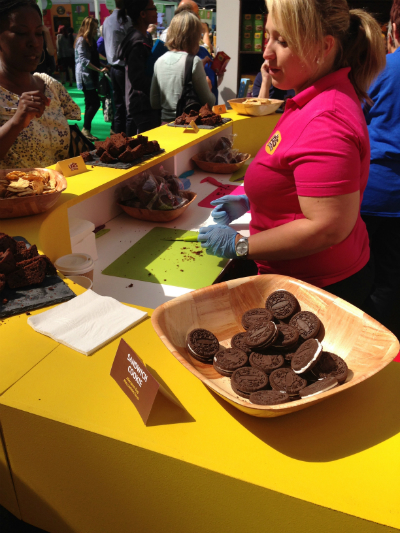 I would still suggest arriving early so you get the benefit of plenty of samples and time to talk to stall holders. The Free From section are all together making it easier to locate your favourite products. It is definitely worth bringing a backpack or trolley to take home all your goodies. Plastic bags soon get very heavy. Also something I forgot! a cool box for some of the fresh produce like Pudology puds, lots of pizza’s pies, sausages etc. Being such a hot weekend warm sausages are no fun! I didn’t risk taking any home. 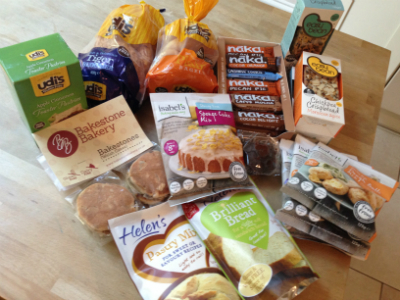 My gluten free stash ! All your favourite brands are at the fair, the big companies like Udi’s Newburn Bakehouse, Sainsbury’s etc and plenty of smaller independent companies. Do support these small businesses as without our support we will just be left with the huge companies producing often poorer quality products. 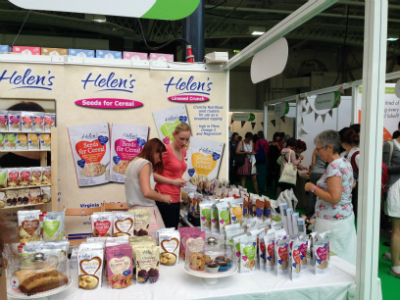 There are many different exhibitors at the Allergy and Free From Fair I’m sure you will search out more gems! I was able to meet up with fellow Free From Bloggers which made my trip even more worth while, it’s always good to put a face to a Twitter name. 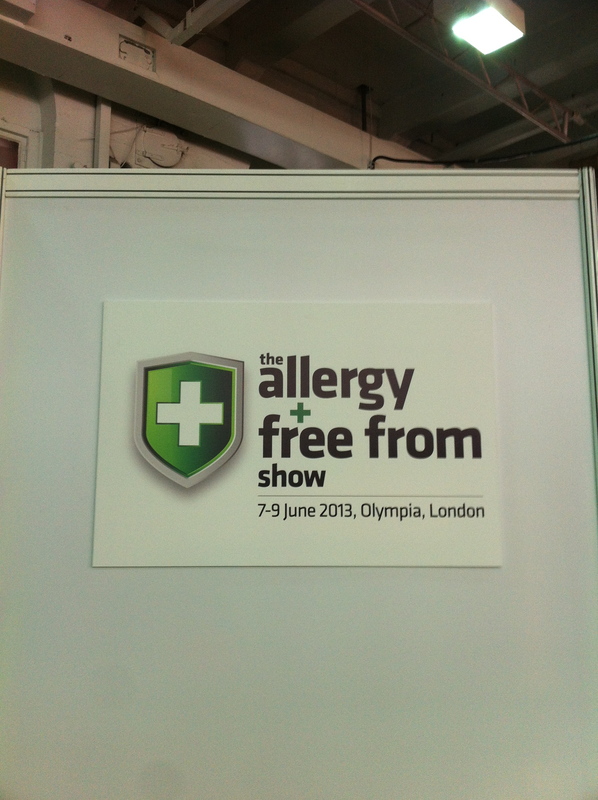 Last Saturday I made my first visit to the Allergy and free from show at Olympia. Now I had been warned that I would need lots of bags to bring back the many gluten free offers. So bags in hand and a husband, or should I say official bag carrier. We boarded the train to Clapham junction then went on the overground train to Olympia. Arriving at 10am just as the doors were opening. A large queue had formed outside the hall but we quickly made our way inside. 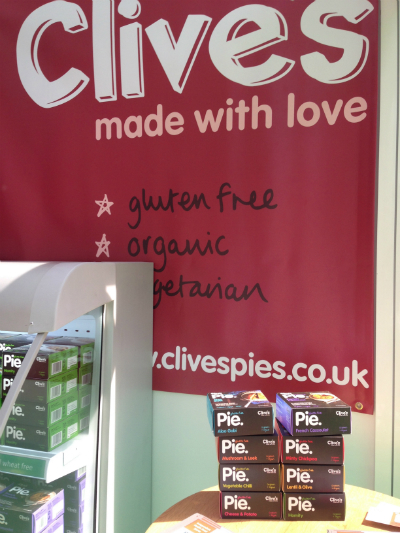 I was so glad we had arrived so early as we were able to make our way to the gluten free stands with ease. 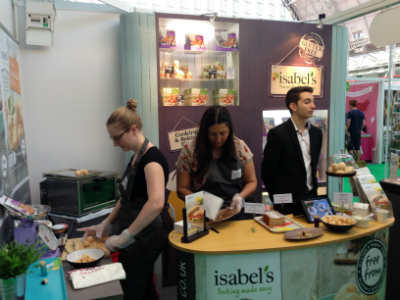 One of the first stands we found was Isabel’s cuisine. It was lovely to meet Isabel in person as I have followed her on twitter for a while. The Pizza mix is so versatile I have made the pizza bases before and I cannot wait to make bagels with it very soon. They had a very good offer, I bought five boxes including the batter mix and dough ball mix, another tweeter was on her stall the happy coeliac who had made some yummy cakes using one of Isabel’s mixes. It was great to meet her too and try the delicious cakes. 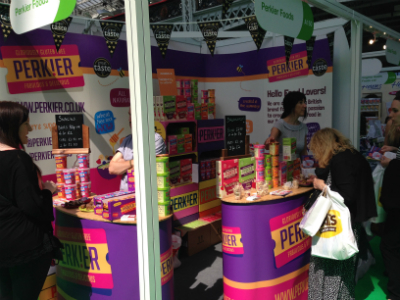 Moving on we found Perkier also on Twitter , a small business who use gluten free oats to make a selection of porridge and granola. One thing I thought was particularly good was the individual instant porridge pots which would be great for a weekend away or festival food. We both tried some flapjack made using the apple and cinnamon porridge very good! I went away with a box of porridge. Now being gluten and yeast intolerant means i’m always on the look out for a bread I can eat. 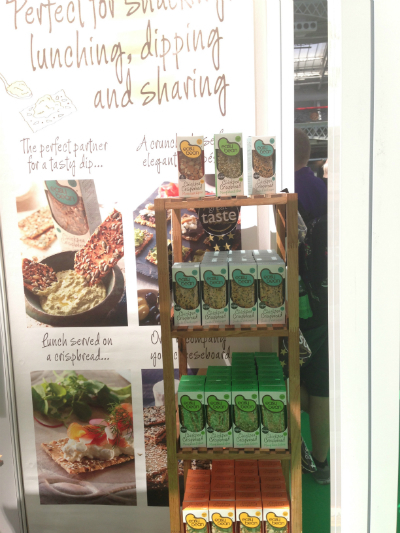 At the show we found Sukrin they had a sunflower and pumkin bread mix which was soy milk and yeast free. result. I filled a bag with a supply of bread mix, I cannot wait to try making it at home. 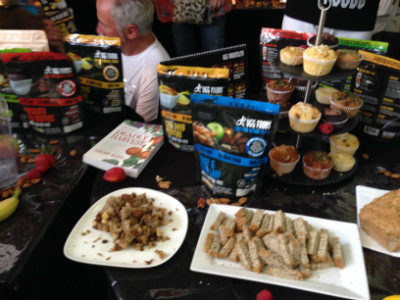 The taster on offer at the show was good, denser than regular bread but that is to be expected. Moving on we found Nairns gluten free and as they had a special offer on packs of savoury biscuits I picked some up. Warburtons also had a stall and had there new wraps at £2 a packet. So brought some for the freezer. I really wanted to search out small businesses as I feel it is important to support them, on the next isle we found one such business, Knead. It was good to meet Sim in person a I follow her on Twitter and was eager to try there gluten free yeast free bread. They had a good offer on the gluten free bread so once again choose 3 loaves 2 seeded and one white. Almost demolished one loaf within 2 days scrummy, I even made a fish finger sandwich something I hadn’t been able to have in ages. Good news if you weren’t able to get the show Ocado are now stocking Knead bread. We took a break from the stalls and made a dash to the cafe area where a TweetUp was taking place, It was great to meet up with many fellow coeliacs and gluten sensitive Tweeters and put faces to names. It is such a supportive community and I can recommend joining Twitter. I have learnt so much in the last year or so about Coeliac disease and tips on baking, shopping, cross contamination and living with a gluten free diet . After spending some time at the cafe , we said our goodbyes and headed back to the stalls. Unfortunately it was now 12ish and the hall was rammed. Fighting through the crowds we headed towards the free from bakehouse previously called Sugargrain where we chose lemon meringue tarts to take home, also choosing a cinnamon sugar doughnut for my journey home. 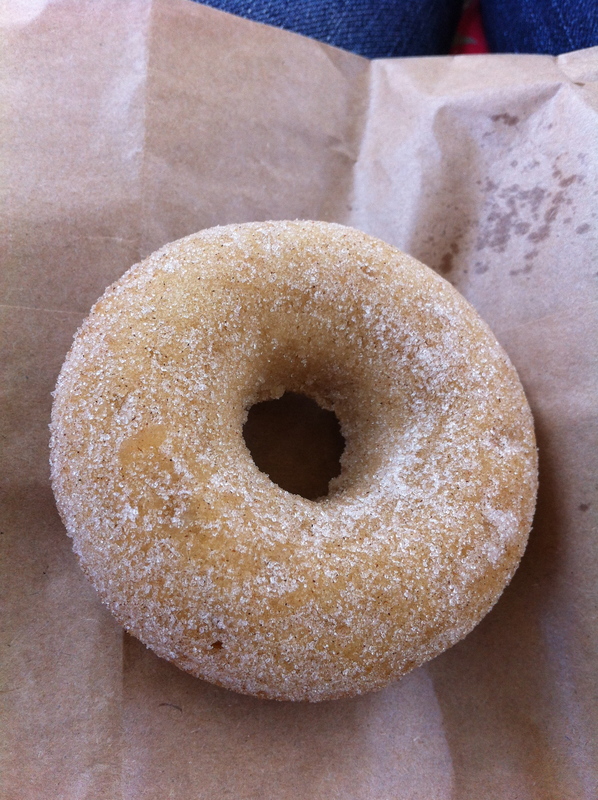 Whilst it was quite nice, I think it would have been nicer eaten with a big mug of coffee as it was a little dense. 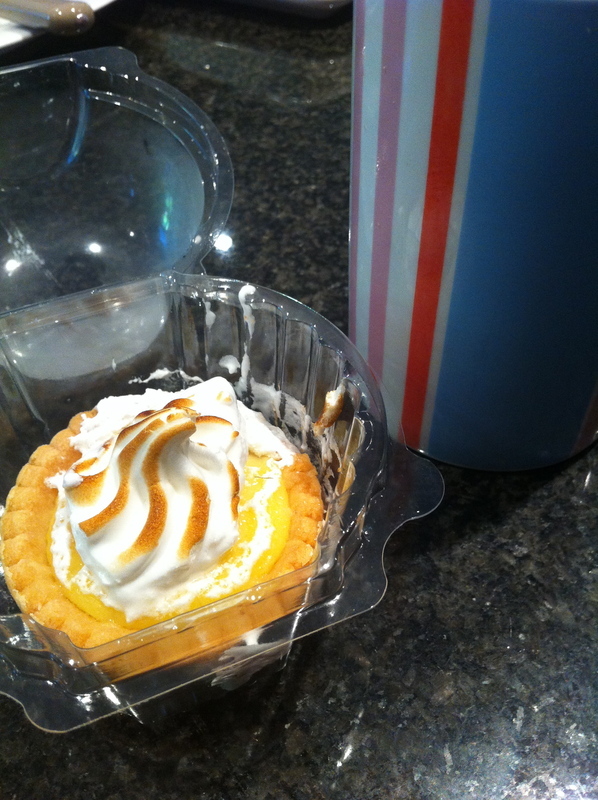 The Gf lemon meringue tarts survived the journey very well and were delicious the gluten free pastry was very good. DS gluten free had a stall and I decided to treat myself to a few boxes of bourbons and chocolate biscuits. 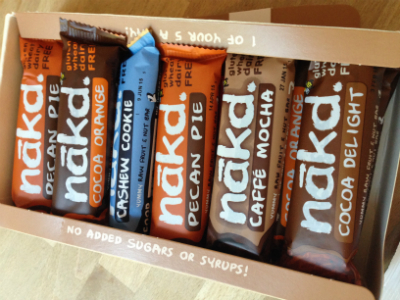 I like them as they are in little packs in side the boxes and keep well. 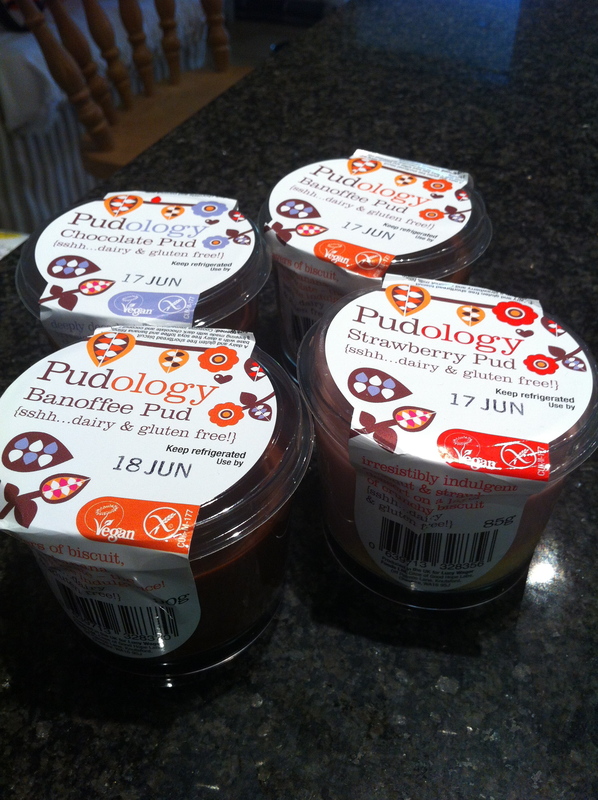 We found another new company I hadn’t come across before Pudology run by Lucy. Individual Puddings dairy, egg and gluten free. 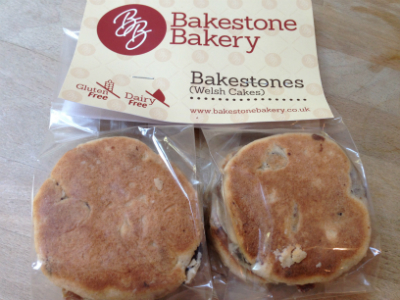 We tried the chocolate, lemon and banoffee puddings and brought 4 to take home. Again Ocado are stocking them as are some Waitrose shops. The banoffee was particularly good. Deciding that it really was now too busy we reluctantly made our way to the exit, very relieved I had taken my husband with me, as had far too many bags to carry by myself , also needed more cash than I had expected as not all stalls took cards. He came in useful for that too! 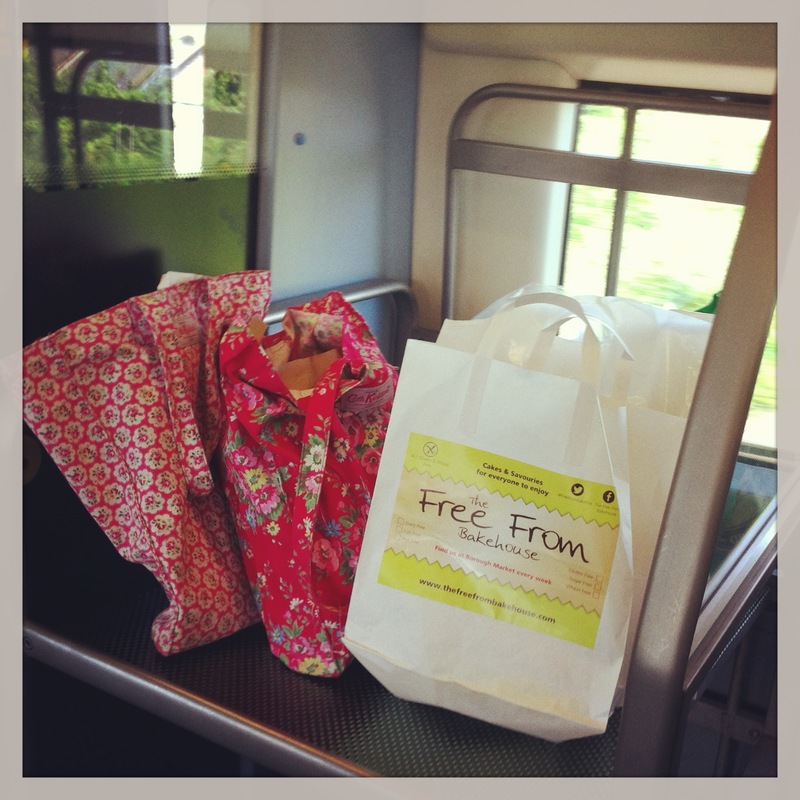 Just our bags alone took up all the baggage space on the train! 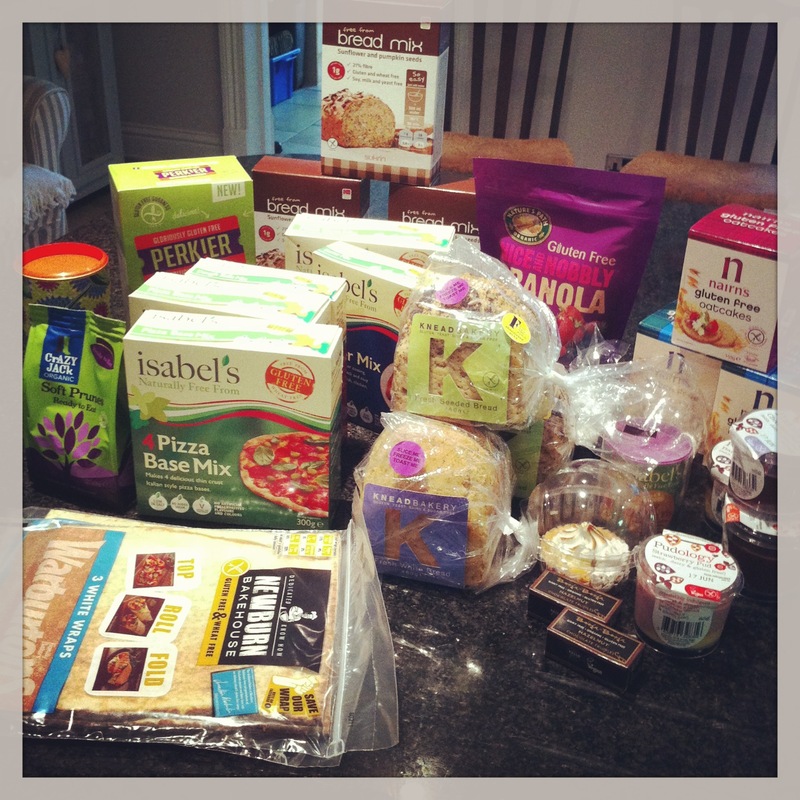 Finally made it back home with a huge array of gluten free goodies. No shortage of choices for a late lunch. I will definitely be returning next year and hopefully will find even more small businesses.